What topics are included in the index? When analysing an index, it’s ‘relative performance’ that matters. It’s not how good your performance is, but how good your performance is compared to other cities. Achieving a certain place one year doesn’t guarantee the same result the following year. To keep your place you have to keep improving; doing nothing is not an option. An improvement in the ranking means that your performance is relatively better than the rest of the cities. On the other hand, a fall in the ranking doesn’t necessarily mean going backwards, but instead that your performance was not enough to catch up with other cities. Balance across themes is crucial in sustainability. Coventry consistently achieved the best results on the three themes, therefore it’s no surprise Coventry has the best overall ranking. These results show evidence of disparities issues within our region. Geographically, these cities are not far from each other. 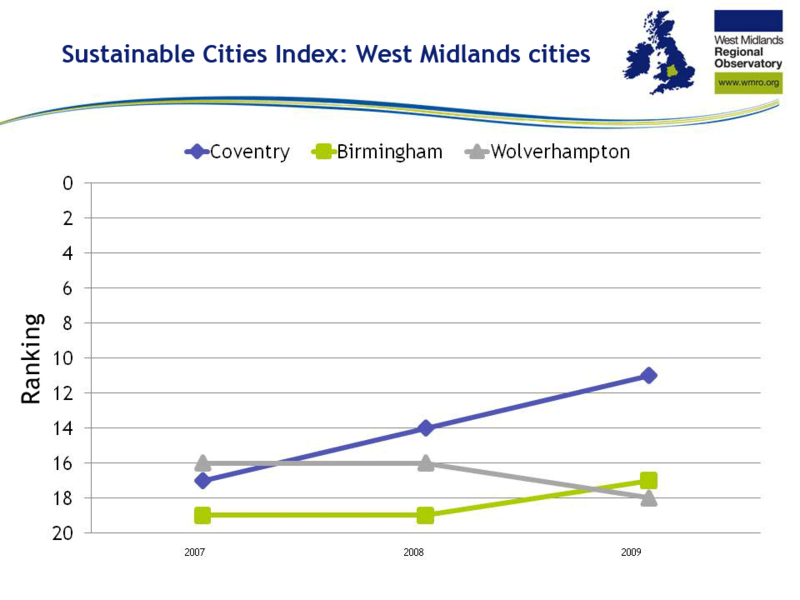 However, Birmingham and Coventry’s environmental performance is considerably ahead of Wolverhampton’s. The difference between them represents the opportunity to be in 5th place or at the bottom of the ranking. 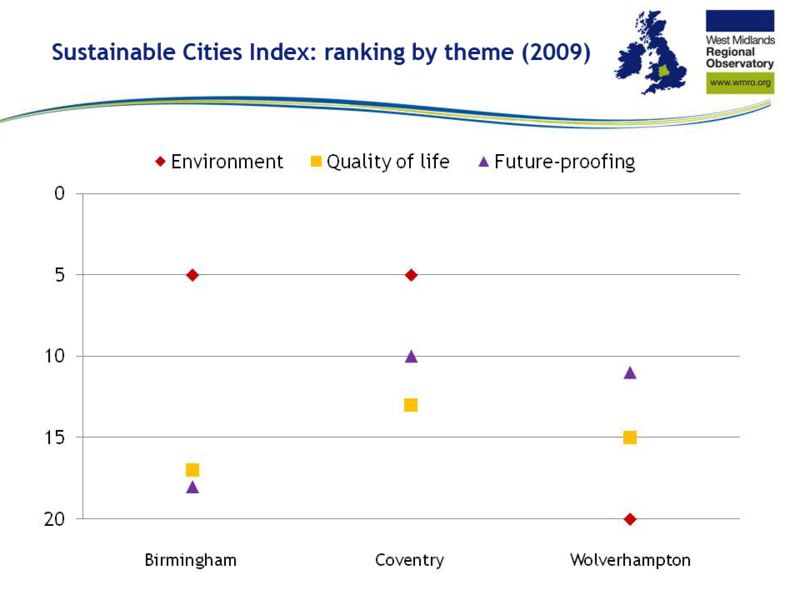 In the same way, Wolverhampton is 7 places ahead of Birmingham when analysing the ‘quality of life’ theme. The charts below show results achieved for each indicator, with 1 being the worst and 20 the best. A city will be more sustainable the closer it gets to 20 across all indicators. Download a slide showing all three indicators (png, 85kb). These charts above present the strengths and weaknesses that each city is facing. For example, ecological footprint is relatively strong in the three cities while air quality is a potential area for improvement across all three cities. The opportunity to analyse the results by indicator is a useful way to identify priorities that can boost the sustainability of the city. It also provides an easy way to identify good practice examples from other cities. 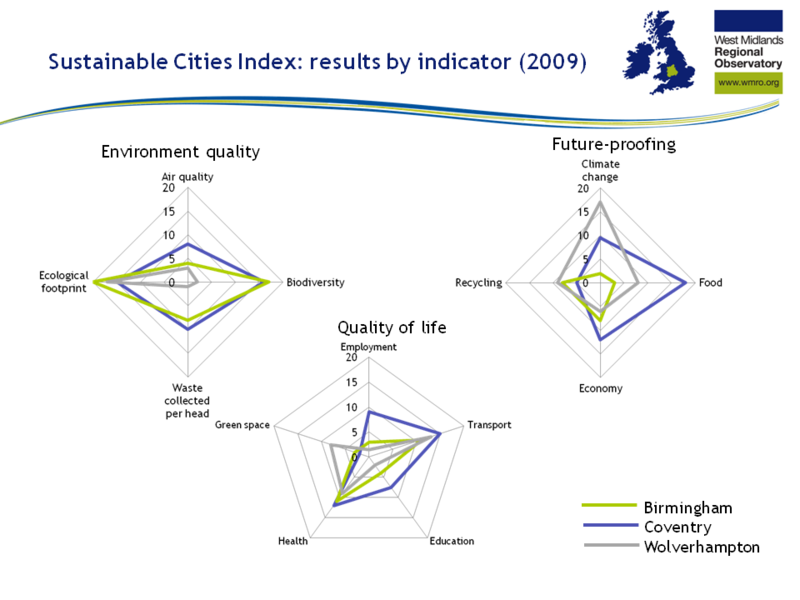 For example, Birmingham is stronger in ecologial footprint, Coventry stronger in food and Wolverhampton is stronger in climate change. The Observatory recently published What makes a community sustainable? (pdf, 457kb) as part of our dialogue on sustainable communities. The report focuses on identifying the factors which make communities sustainable and proposes a set of indicators that will enable us to objectively measure the level of sustainability across communities. Sustainability is not one indicator; it compounds a wide range of topics influencing and shaping localities. The Sustainable Cities Index groups them in three broad themes and 13 indicators. Our dialogue identified six broad themes and proposes a set of 36 indicators. Acting on themes or indicators individually will not deliver sustainability. Interventions need to be coordinated across all of them. Both publications include indicators from publicly available sources.